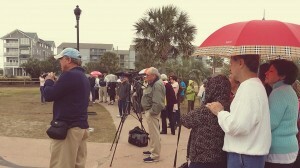 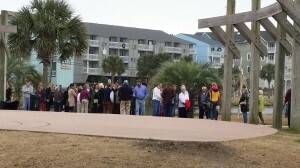 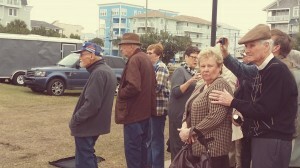 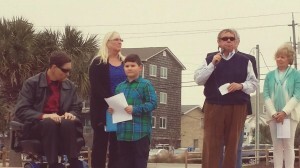 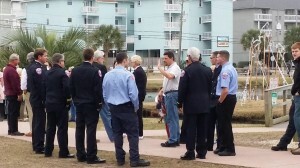 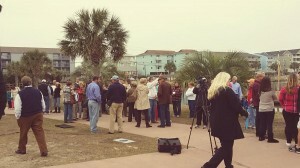 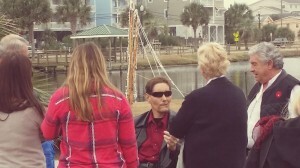 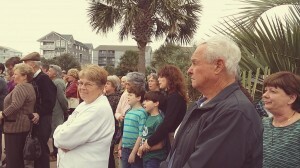 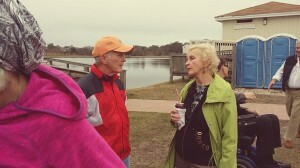 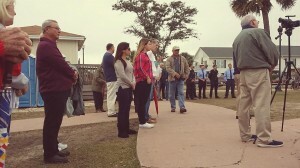 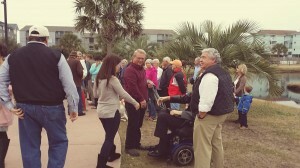 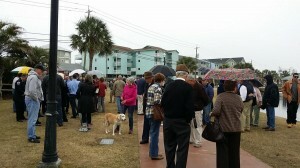 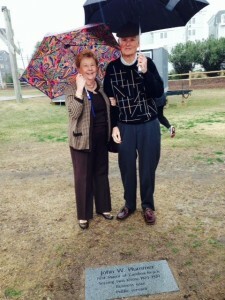 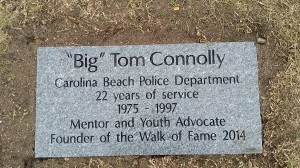 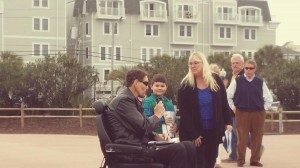 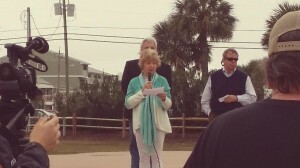 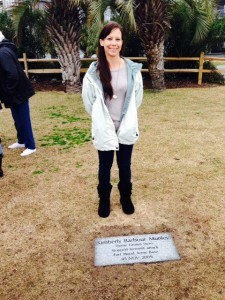 The Carolina Beach Walk of Fame unveiling ceremony was held on January 3rd, 2015 at 2 pm at the Carolina Beach Lake. 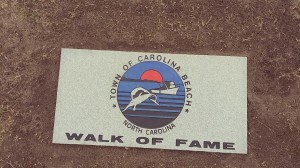 This year’s inaugural Walk of Fame was created to recognize ten people or families who have made tangible and lasting contributions to the Town of Carolina Beach through their outstanding leadership and service. 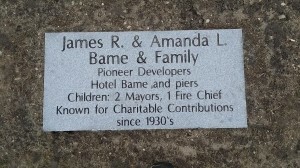 Each year five more people or families will be chosen for this award. 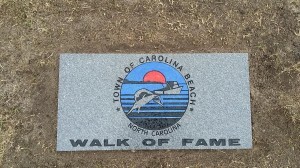 Letters of nomination, listing the recipients’ contributions to the town, will be submitted to the Walk of Fame selection committee. 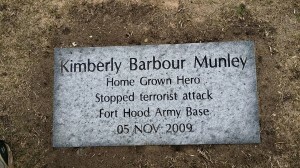 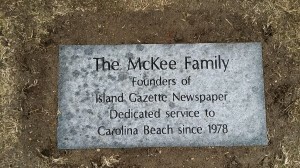 After vetting, selected recipients will be honored with a granite stone, displaying their names and their contributions to the town. 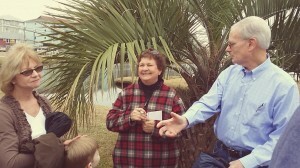 Throughout the year, there will be fundraisers and the selection committee will accept donations for the following year’s recipients. 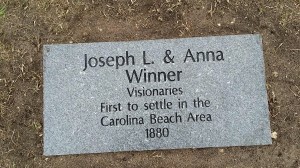 Tom Connolly, Joseph and Anna Winner, Capt. 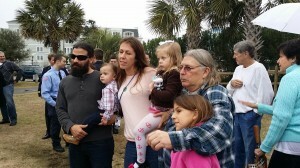 John W. Harper, John W. Plummer, James R. and Amanda L. Bame and family, Glenn Tucker, Robert “Bob” Weeks, Pat Efird, Kimberly Barbour Munley and the McKee Family. 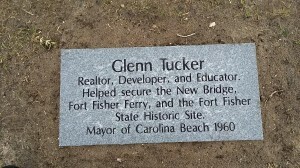 The Federal Point Historic Preservation Society is partnering with the Citizens Recognition Committee to create a lasting memorial at the Carolina Beach Lake. 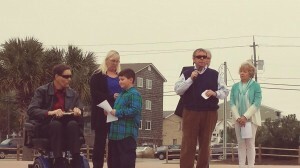 At the November, 2014 Carolina Beach Town Council meeting, the Committee made a request for start-up funds and the request was approved. 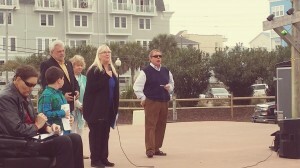 Two members of the Federal Point Historic Preservation Society are assisting the Citizens Recognition Committee: Darlene Bright as a member of the Committee and Demetria Sapienza as finance supervisor. 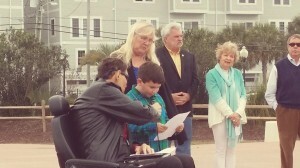 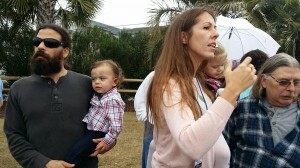 The Committee’s basic function will be to accept nominations and choose no more than five citizens each year who have made a tangible and lasting contribution to the Town of Carolina Beach through their outstanding leadership and service, advancing the economic and social development of Carolina Beach as a residential community and beach resort. 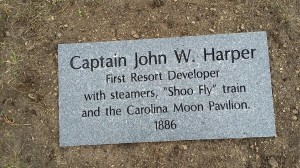 The Committee will review nominations and confirm the information received with the Federal Point Historic Preservation Society to ensure that the information is historically accurate before selecting recipients. 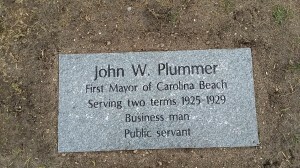 The Committee will solicit and receive contributions and donations to provide for the making of the monuments and these funds will be deposited with the Federal Point Historic Preservation Society for the benefit of the Citizens’ Recognition Walk of Fame. 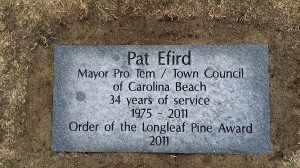 Each monument will be light gray granite, weighing 165 pounds and measuring one foot by two feet and four inches thick. 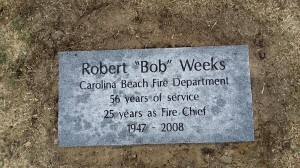 The monuments will be placed along the walkway around Carolina Beach Lake.